Last week the city of Rotterdam presented a series of plans for the city centre. 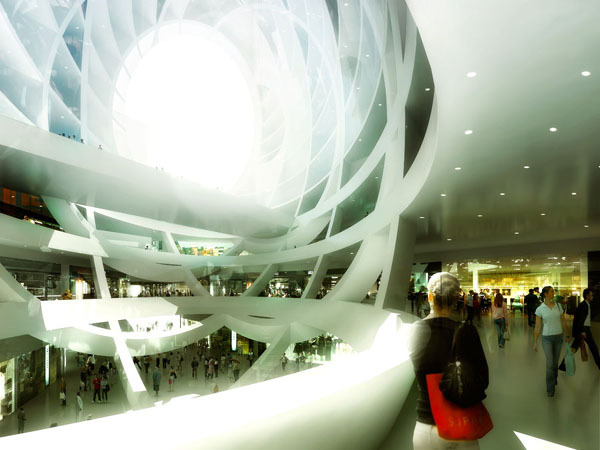 The most striking of them concerns the conversion of the former main post office into a shopping paradise by UN Studio. Today OMA presented the design for what amounts to much more than a second ‘Koopgoot’. 1. The cheese as seen from Binnenwegplein. Speaking of consumer palaces, after the success of the Koopgoot (the underground shopping traverse linking The Lijnbaan, the metro station and the Hoogstraat) it wasnt going to take long before someone copied the winning formula. But at the press presentation of OMAs concept for a second Koopgoot the scheme turned out to encompass much more than an extension to the shopping arcade beneath Coolsingel. 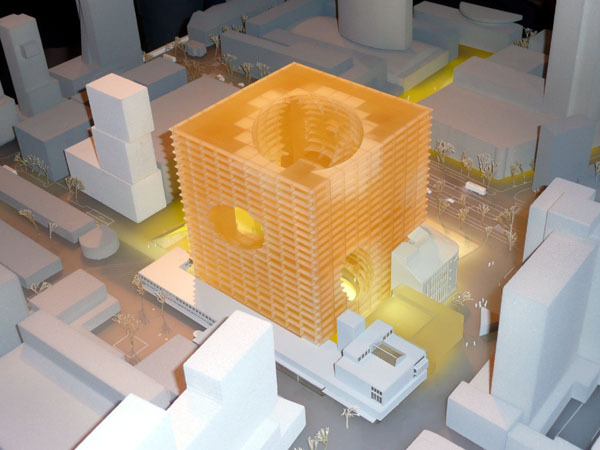 The city block bordered by Coolsingel, Lijnbaan, Binnenwegplein and Beurstraverse is to be filled with an 85-metre tall mixed-use cube. Three city monuments  the ABN/AMRO brick office, construction of which started in the 1940s; the Lijnbaan row of shops; and Donner bookstore  will all be retained. The cube is made up of four levels of shops, starting on the level of the Koopgoot, with above it a mixture of dwellings and office space. The volume is generously cut by diagonally placed oval voids that create diagonal sight-lines and scope for sunlight to enter. The voids are expressed in the façade as big round holes in the mass of the cube. Located on the top floors and half-way up the building volume are the public functions. 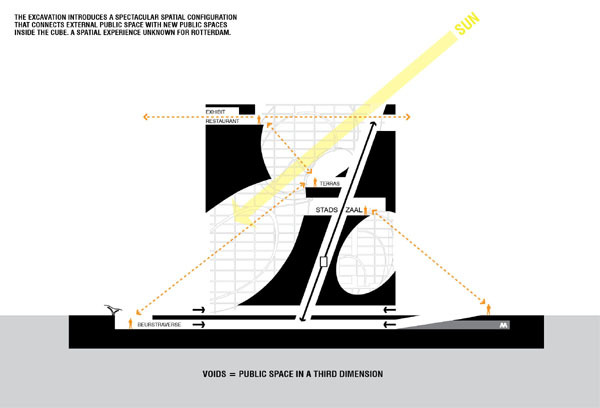 Besides spaces for encounter and entertainment, museum and theatre spaces are under consideration. Although it wasnt touched upon during the presentation, the design unmistakably owes much to the unrealised competition design for the Très Grande Bibliothèque in Paris in the 1980s. That, too, was a massive cube hollowed out with huge voids that are expressed in the façade. Moreover, it must be no coincidence that the presentation model was coloured yellow. That favourite pastime in Rotterdam, thinking up the best nickname for a new building, could begin. Current favourite: The Koolhaas Cheese. A project of around 120,000 m2, an investment of roughly half a billion euro, potentially a logistic nightmare as a construction site: you cant accuse property developer Multi Vastgoed of lacking courage. This metropolitan block has the potential to become an architectural highlight in Rotterdam. Whats more, the project offers an alternative to the all-too-easy addition of tower next to tower next to tower. A lower and thicker building block offers more options for a useful connection to street level and the creation of public spaces above the city. With the notion of City Lounge as guiding principle, the centre of Rotterdam will, the municipality says, be transformed into a quality location for encounter, enjoyment and entertainment. Ever since the completion of post-war reconstruction some time back in the mid-1960s, Rotterdam has struggled with its image as an empty, bleak and even unsafe city centre. Its debatable if that reputation is borne out in reality, but whatever the case, municipal policy since the 1970s has focused on undoing that bleak image. In practice, that has primarily resulted in an increase in the amount of retail and office space, which is important for city economy but not necessarily a recipe for encounter, enjoyment and entertainment. Retail is a priority in the newly presented plans too  shopping as the highest form of encounter, enjoyment and entertainment. Cafes, restaurants, culture or just empty public space has to be content with a supporting role next to office and retail space. 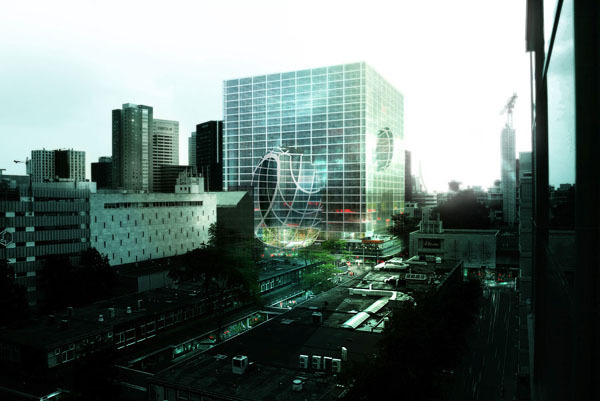 Last week UN Studio presented its proposal to renovate and extend the former main post office. The monumental façade on Coolsingel and the splendid main hall with its parabola roof will of course be retained, but the building will be filled with luxury shops. UN Studio also proposes to extend the building at the rear with a tower containing accommodation in the form of a long-stay hotel. The developer expressed misgivings, particularly concerning the feasibility of these relatively expensive square metres in the tower. To provide access to the shops on the upper floors, a glass vertical foyer is planned on Meent. This glass entrance is necessary because the main entrance to the former post office is not very inviting. A fine addition, therefore, that respects the old building and, moreover, forms a clear entrance from Meent. The aim is to keep the old central hall open to the public after the shops have shut. Whether or not the hall will really become a place of encounter is the question. The interior will largely be geared to shopping, while the public aspect is a secondary concern. The type of entertainment usually offered in such shopping plazas is rarely very advanced in cultural terms. The main hall is out of its depth as a party room for the entire city, a function the space seemed eminently suited to perform. At any rate, its difficult to imagine a gabber reunion, a city race or a wild Caribbean dance event ever taking place there.